A front panel mount controller in two flavors, both offered in the same DIN sizes and both cost the same. The difference is in the factory default program menu system. The Ez-Zone®PM Express intended for basic heat/cool applications provides a user friendly front panel interface and utilizes a two menu program with a streamlined list of parameters that eliminate the complexity often experienced with process controllers intended for various applications other than controlling temperature. The simplicity in setting up and operating the express model will reduce training costs and programming errors. The standard Ez-Zone®PM controller has more extensive program menu options to provide enchanced optional features. 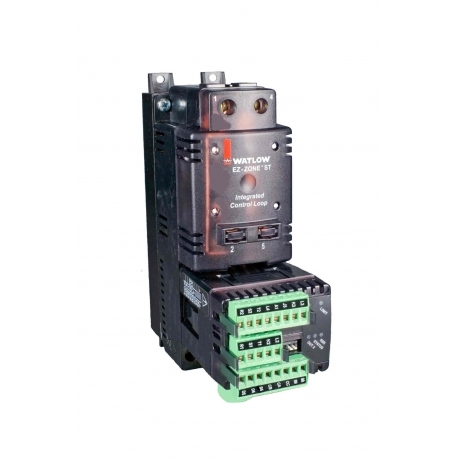 This version of the PM series can integrate both a PID control and a high/low safety control in the same controller or it can be ordered with two PID controls in the same controller. See more information on the features of the Ez-Zone PM controller. The Ez-Zone®ST is a complete thermal control system in a safe to touch compact package that can be either DIN rail or back panel mounted. This compact controller eliminates compatibility issues often encountered when using different components in a thermal control loop. The Ez-Zone®ST provides a turnkey solution with a preconfigured design that reduces installation time and money and ensures a reliably efficent and accuarate control system. A choice of components provides flexibility for use in various applications. The modular design allows integrating multiple controller configurations in less space than the old fashion way of seperatly wired individual components see more information on this modular and scalable control system. See the six module options and details of this highly scalable and cost effective thermal control management product.